How excited is Peter Radziszewski? You could say the McGill Mechanical Engineering professor is over the Moon. 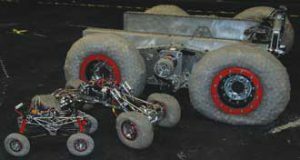 Radziszewski is leading a team of colleagues and students as part of a Canadian Space Agency-funded project to develop and test advanced prototype wheels for a new lunar rover. How excited is Peter Radziszewski? You could say the Mechanical Engineering professor is over the Moon. Radziszewski is leading a team of colleagues and students as part of a Canadian Space Agency-funded project to develop and test advanced prototype wheels for a new lunar rover. McGill was contracted as one of several teams headed by Neptec Design Group. The advanced space, defence and industrial systems, and applications company was awarded one of two $11.5-million CSA contracts to build a Lunar Exploration Light Rover (LELR). LELR will be the new Canadian lunar rover that will be tested for lunar exploration missions to carry payloads, cargo and crew, as well as enable drilling and excavation, manipulator and tool integration, and vision and state-of-the-art communications systems. “My students and I are thrilled to be on the Neptec Rover Team (NRT) as it will allow us to advance our earlier prototypes of lunar-friendly wheels and make a significant and innovative contribution to Canada’s space program,” said Radziszewski. Creating a wheel for some of the worst potholes known to humankind is just one of the extraterrestrial challenges the McGill team will face in developing and testing the wheel on the treacherous lunar terrain. Radziszewski began working on wheel design and prototypes in 2008 following a sabbatical at the CSA. Upon his return to McGill, he brought together professors Damiano Pasini, Vincent Thomson, Larry Lessard and David Lowther to work on traction system development for lunar mobility as part of a joint Neptec/CSA/NSERC funded project. Since then, some 60 students have been able to work on lunar mobility-related projects as either undergraduate or graduate students. The suite of iRings prototype wheels: 12.7 cm, 20.3 cm and 55.9 cm diameter. / Photo: Brad Jones/Neptec Design Group. One of prototypes has a lot in common with the armour worn by knights of the Middle Ages. Dubbed iRings, the wheel is made of an external chainmail fabric filled with granular particulate matter; sort of like a metal bean-bag chair shaped like a wheel. This distinctive design provides both flexibility and sturdiness when travelling over extremely bumpy lunar terrain. The wheel’s name “iRings” is short of iron rings, which is a symbol of the Canadian Engineering tradition that exemplifies the social and ethical responsibilities of the profession. Such highly developed wheels may offer Earthly applications, too, such as for vehicles which need to travel over rubble caused by civil or natural disasters. Radziszewski has been able to draw on his expertise in mineral processing specifically comminution or grinding and mechanical design – he initiated and supervised the development of an electric snowmobile that was demonstrated at the 2010 Olympic torch relay. That unique combination of expertise made him an interesting resource person who could understand the challenges of driving on the difficult and extremely cold terrain of the moon. Radziszewski is quick to recognize the efforts of his fellow professors and students from both the graduate and undergraduate programs who have been and will be involved on the wheel portion of this project and other aspects of the rover’s traction system development. A dedicated teacher, Radziszewski lauds the opportunity this provides for educators and students to make a major contribution. “This effort is really a nexus of teaching and research. We have built a bank of expertise in creating intellectual property that supports a Canadian space-mobility effort,” he said. The final prototype of the lunar rover is expected to roll out in the spring of 2012. This video shows the first 5-inch chainmail iRings prototype wheel composed of a stainless steel 4-in-1 welded chainmail tire on a rigid aluminum beadlock rim and filled with delrin plastic ¼-inch balls. 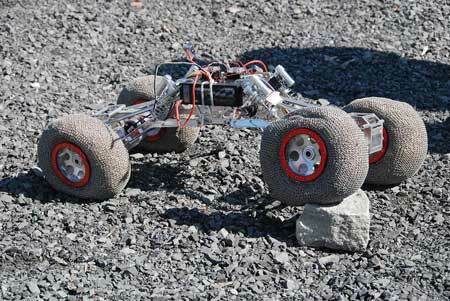 The test vehicle is an off-the-shelf radio controlled rover. In this scenario, the rover overcomes two rocks. It is interesting to note how the iRings wheel conforms to the rock surface as it goes over them. iRings v2 015. Mechanical Engineering professor Peter Radziszewski and several of his students recently delivered their distinctive chainmail and particle-filled wheel – the iRing – to the Canadian Space Agency. The wheel, a prototype for a new lunar rover being built by the CSA and Ottawa-based Neptec, underwent a successful test run at the Mars site at the CSA. Replete with rocks, craters and sand dunes, the terrain replicates extreme and difficult driving conditions. The handover was featured recently the Discovery Channel’s news program The Daily Planet.